Wrapping a Sandwich in Lettuce: It Works! I am not gluten-free nor do I aspire to be. But, there is much to be learned from new attempts at cuisine. Like a sandwich made with lettuce instead of bread. I have tried to make “lettuce” wrapped food in the past and found that the concoction fell apart in my hands causing a big mess. Why not just make a salad and put the fixings on the top? If you are taking your lunch to work or somewhere that a fork would be a pain – it would be a good thing to be able to pick up the sandwich. My thinking here was that I hadn’t used the correct lettuce when I had attempted lettuce sandwiches in the past. I needed something TOUGH. I bought a head of iceberg - seriously strong versus other lettuces - to see if I could make a lettuce sandwich that would hold together. After making a big mess, I came up with cutting the head of lettuce in half so you can easily get “slices” to roll up your sandwich fixings. The leaves from the entire head are much too big to work with and turn out floppy sandwiches. This sandwich is crunchy, salty, and quite refreshing (especially if the weather is hot). It also does feel like a sandwich! 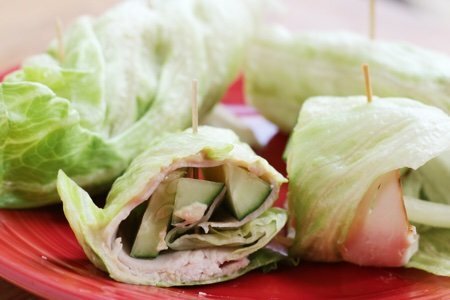 Have you tried to make lettuce wrapped sandwiches? Slice head of lettuce in half. Remove 4 leaves of lettuce big enough to wrap a sandwich. Spread one teaspoon of hummus on each leaf, layer a slice of turkey, and a few pieces of cucumber. Roll up the sandwich and fix into place with toothpicks. Kale is also great for cold cut sandwhiches, kind of annoying to wrap but tasty. When you say 'Slice head of lettuce in half', do you mean top to core (vertically) or side-to-side (horizontally)? Silly question, I know, but it would make a difference in the shape of the lettuce. Reminds me of the "un-which" they sell at Jimmy John's.. tasty! My teenage daughter and I have been making lettuce sandwiches for years. Very satisfying! Yes, you need long, solid leaves of lettuce. We like to use romaine. I haven't tried lettuce wraps but I would imagine softer green leaf or red leaf lettuce might be easier to roll up. Not as crunchy but just less fuss. Crunch can be in fillings instead. Will have to give it a go! My daughter prefers gluten-free, finds it less bloating and is just everywhere these days [even at pizzerias and lobster shacks]. I use romaine also for my lettuce wraps. I just put all the ingredients down the center rib and wrap long ways. It works perfectly! I make lettuce wraps occasionally - always use a large, sturdy leafy green like swiss chard or collard green. It's a nice change! Definitely Romaine. Costco sells Romaine hearts that are basically ready for wraps. Just take a leaf off, wash, and wrap away! Fully Raw Kristina has a great Raw Collard Green burrito recipe. Actually collard leafs are great for sandwich wraps as well. I was at Walmart and they had romaine leafs already pulled off and put in a sealed container so all you had to do is pull it out of the container and use it. The container said that they are already washed, but I still like to wash them. Way back in High School I was dropping weight (I had gotten rather large. Imagine 4'10 and 140lbs and my Aunt was the one that turned me on to using leafy greens as your bread. if I have a burger I don't use buns (usually). My favorite is egg and tuna salad in a butter leaf cup. I buy red leaf lettuce spears that are good for wraps. They come in a plastic box already washed. Yes, One Time. Two Slices Of Low Fat Bologna, Ketchup And Cheese Were Wrapped In Lettuce. I Could Not Decide between a Hamburger Else A Sandwich And Also I Had a Huge Piece of Lettuce Available.